Terms of Engagement, Urban Design in Los Angeles at the Millennium, on view last winter at the Luckman Gallery, featured several schemes for reinterpreting Grand Avenue as an animated pedestrian precinct in the heart of downtown. One, by a team of pre-eminent architects led by Frank Gehry, is the result of a “Summer Workshop” initiated by the Performing Arts Center of Los Angeles County – a scheme for the redevelopment of the Music Center Plaza, the Civic Mall, and the stretch of Grand Avenue between 5th and Temple Streets. The team’s distinguished cast also included Arata Isozaki, Rafael Moneo, the Olin Partnership, and Stuart Ketchum, with Altoon + Porter as Executive Architects. The other scheme, a CRA commissioned design by Doug Suisman (of Suisman Urban Design), encompasses the same five-block stretch of Grand, complementing previous studies in which he looked at the Civic Center and the larger context of the 10 Minute Diamond around it. His project team also included the Olin Partnership, along with Francis Krahe, Kim Yasuda, and Nabih Youssef. The Gehry Team project envisions sweeping revisions to the existing urban fabric in order to transform the pedestrian spaces surrounding the Music Center. Suisman’s team, on the other hand, is more pragmatic, adapting to the existing conditions with a series of finely tuned interventions. While both of these urban design concepts encompass “big” ideas, the former is characterized by expansive gestures, while the latter comes alive in the details. Grand Avenue has been an enigma since its inception as the centerpiece of the CRA’s most ambitious urban renewal project of the sixties and seventies. 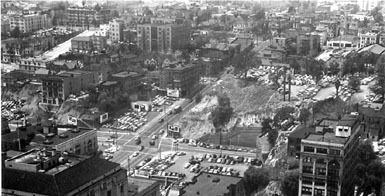 Once a hillside of mansions turned boarding houses, Bunker Hill was leveled to create a major redevelopment area focused on Grand. The hilltop thoroughfare was essentially reconstituted as a double-decker ribbon of infrastructure, with a major traffic artery above, and service and parking access below. Flanking it were super-blocks envisioned as the sites for multi-story, mixed-use developments. In the last thirty years, about two thirds of the avenue has been filled in with office towers (a lot of red granite), the Omni Hotel, the Museum of Contemporary Art, one condominium tower and the Colburn School. One of the last available quadrants is now being filled by Gehry’s Disney Hall, leaving three to four parcels still to be developed. In spite of the large-scale commercial complexes and even the near-by presence of high rise housing, the hill is largely empty in the evenings and on weekends. It remains to be seen if this district can move from the fringe to the center of consciousness in the minds of Angelinos. Infilling the development parcels of Bunker Hill has required great ingenuity: with Grand Avenue at the brow of the hill, the flanking streets – Olive to the east and Hope to the west – are between fifteen and thirty feet lower, requiring massive podiums with plazas, cascading stairs, and multiple entrance points, both for cars and people. At the Museum of Contemporary Art, a symbolic porch leads to a stair and a main entrance a full story below the street. Its street frontage ends up being a series of low blank sandstone walls. The site was simply too big a hole to fill. The diminutive form of the neighboring Colburn School reflects the similar difficulties of a relatively small program attempting to fill an overpowering site. Further along the street, the Omni Hotel solves its site challenges with a three-story lobby, while sunken terraces edged by various amphitheaters and complex ramp stairs characterize Cal Plaza’s multiple plazas. Another set of holes in the middle of Grand Avenue lets light into the cavernous underbelly of the service street below. Further to the north, at the crest of Grand Avenue, the Music Center’s plaza is a full story above the street, while the Civic Mall, separated from the street by spiral parking ramps, is several stories below. The avenue edges along between a precipice and a chasm. The Music Center, like many successful venues in Los Angles, is a place with easy access by automobile. Each of the four, ultimately five halls sits over a vast base of underground parking with convenient freeway access. People tend to arrive just before and leave just after the theater. Although there are a few places to eat, the streets of Bunker Hill are silent places after business hours. As for the Civic Center’s mall, its lush green gardens are disconnected both from the courts and administrative halls that line it and from the streets above and below. The sidewalks actually flanking Grand Avenue end up being narrow, confined and pretty empty – the activity of the noontime crowds and special evening openings is sequestered in off-street plazas above, below, and beyond. None of the ubiquitous plazas and gardens that have been created throughout Bunker Hill actually address or spill into the street itself. Even Moneo’s new Cathedral precinct is hidden beyond the bulk of the church, choosing to overlook a sunken stretch of Highway 101 instead. Grand Avenue has evolved into a kind of demilitarized zone between competing focal points. The buildings, the figure ground of downtown LA’s urban fabric, have preceded the formation of public space, just as the habit of parking underground will precede going to the Philharmonic at Disney Hall. Gehry and Suisman have both responded to this dilemma with projects which re-center activity along and within the street right-of-way itself. Suisman’s scheme for Grand Avenue fills in the center holes and creates a linear park – “the Esplanade” – replete with handsome street furniture, kiosks and formally planted trees. To the southwest, the “Bradley Bridge” marks the crest of the hill with a lookout point to view the central downtown area below. Further to the northeast, as Grand curves past the Music Center, the space adjacent the County buildings becomes “The Crescent.” This expanded pedestrian zone is in-filled with a “restaurant row” to create a broad, gentle crescent opposite the steps of the performance halls. By redefining and infilling the edges and intensifying the occupation of center median, the avenue becomes inhabitable. In contrast, the Gehry scheme reincarnates Grand Avenue as a Southern Californian version of Nicolette Mall – a curvaceous roadway which actually reverses the geometry of the avenue opposite the Civic Mall, flipping the existing curve to provide a broader sweep of public plaza at street level, on the Music Center side. Further south, new curved segments of the avenue thrust into portions of the remaining undeveloped parcels to expand the public realm beyond the established street boundaries. Where the walls of the existing buildings crowd back against the right-of-way south of Second Street, Grand Avenue resumes its narrow, straight course. The existing Music Center plaza is partially excavated to provide a major outdoor gathering place at street level. A new “Public Gathering Facility,” in the form of a multi-purpose hall, screens the Department of Water and Power beyond and occupies the center of the upper plaza. Its placement reinforces the march of the performance venues along the southwest side of the street and reinforces the avenue as the primary address and “front door” of the theaters. With amphitheater seating replacing the existing precipitous staircase and largely blank terrace wall, a large outdoor performance space, a kind of mini-Hollywood Bowl, embraces the urban landscape. Beyond the temporary stage or band shell, the would-be audience can look across Grand Avenue to a newly constituted mall – a gigantic inclined plane that begins its slope at street level with Grand and terminates at the base of the newly restored tower of City Hall. Grand Avenue and its traffic are shifted to the center of activity – a literal crossroads for LA’s cultural, civic, and county functions. One of the keys to the design of successful streets is the balance between diversity and unity. Diversity alone does not necessarily establish a compelling sense of place (too many suburban retail strips on the edge of too many North American cities are proof of this); on the other hand, highly unified, grand boulevards (for example, Brasilia or New Delhi) can be equally deadening. The Gehry and Suisman schemes are the newest among many attempts to strike an effective balance between a strong overall character and the potential setting for human spontaneity. One landmark attempt to transform Grand Avenue in recent history – the CRA sponsored Bunker Hill Competition – is worth briefly revisiting. In 1980, Baron Myers with Harvey Perloff led a diverse group of architects and designers to create the Maguire Brothers’ proposal for the redevelopment of Bunker Hill: “A Grand Avenue.” Frank Gehry was just one member of an “all-star” team that created a billion dollar complex of offices, housing, hotel and museum – a vision that was both a reflection of its stylistically heterogeneous designers and, at the same, time a coherent and disciplined strategy for urban design and development. The street, with broadened sidewalks and terraced parks running perpendicular through the blocks, became the varied setting of huge commercial and residential towers – a private sector orchestration of a public realm in balance with optimally developed real estate. A diverse team, producing highly varied architecture and public spaces, had nevertheless created a strong, unified environment by means of a well-defined set of urban design rules and principles. In contrast, the two most recent renditions of the avenue must negotiate and carve out inhabitable spaces and establish new connections between them in the midst of the already well-defined territories of public and private institutions. Given the context, it is the unifying aspects of the Gehry and Suisman schemes that must be the starting point for transforming the street. Suisman’s scheme is almost totally located in the public realm, both in terms of ownership and funding. He employs a unified conceptual idea about the avenue to make a comprehensive argument for incremental, small-scale redevelopment of public spaces as interconnected, but uniquely experienced venues. Diversity is established thematically in a chain of spaces – the Bradley Bridge, the Esplanade, and the Crescent. In other words, diversity orchestrated through unity. The Gehry team’s project is a comprehensive recasting of the Music Center and Civic Mall, that nevertheless maintains an emphasis on discrete components. While Suisman proposes a unifying but unique language of street furniture, pavilions, and trees, identifying each of three distinct venues along the avenue, Gehry’s idea is to make a grand gesture of the cross axes of Civic Mall and Grand Avenue. The former is cleared of the encumbrances of existing stairs, fountains, trees, and terraces to become a more minimalist terrain, while the latter is transformed into a river-like serpentine path meandering through a dense grove. In re-emphasizing the primacy and interconnectedness of the cross axes, the Gehry team has actually removed the unifying gestures of the arcades and plaza at the Music Center “acropolis,” allowing Disney Hall, the Dorothy Chandler Pavilion, the new “Public Gathering Facility,” the Mark Taper Forum, and Ahmanson Theater to be read as five distinct buildings, each with its own unique character. Lined up in a row, they almost jostle each other, and dematerialize the remaining half of the upper plaza to gain presence on the street below. While the renderings of the amphitheater steps, mediating between the upper plaza and Grand Avenue, depict throngs of people participating in a great outdoor concert, the approach to the individual buildings is, of necessity, more discrete, and the links between the halls on the upper plaza are somewhat disjointed. Disney Hall, a block away to the south, cannot directly participate in this recasting of the Music Center plaza. Its inclusion relies on its prominent siting at the end of one of the reverse curves and on the device of a giant projection screen, entertaining patrons at the entrance of the new hall from the backside of the Dorothy Chandler Pavilion. In each case, these projects are forced to tackle the fundamental nature of the street as infrastructure in order to make Grand Avenue inhabitable. Suisman borrows a lane from each side of the street to gain sufficient space for the boulevard park, revises the street lighting, and recreates the planting palette. Staircases, like those at the entrances to the Metro, lead down through the center boulevard to the service street below where carefully orchestrated graphics direct pedestrians to flanking parking garages. Gehry’s scheme goes one step further in reversing the broad curve between Temple and First to create more public space on the Music Center side and then fundamentally altering the geometry of the street further south. In each case, there is the implicit understanding that the underground parking garage beneath the Civic mall, with its spiral ramps, must somehow be further submerged to strengthen surface connections and ease pedestrian movement. In fact, Gehry’s scheme actually proposes a new level of parking on top of the existing subterranean levels so that the inclined plane of the mall can meet Grand Avenue Plaza on the same level. Establishing a convincing scale for human activity on the top of Bunker Hill is a particular challenge that has been approached in different ways by these two schemes. Both projects focus on the development of “pedestrian friendly” environments: one puts a fine-grained array of cafes in the center of the street; the other places an amphitheater to one side, facing the street. What is common to both is the self-consciousness of these designs as settings for people. Both the boulevard park and the amphitheater steps create settings that put people on display, and, at the same time, make the street itself the focal point of activity. The fundamental difference in the two approaches is in scale. The occupied Gehry amphitheater represents a throng of hundreds, perhaps thousands of people. The frame of reference is set in terms of distant, axial views. Its design, with light towers, balconies, and a portable stage is a setting for large-scale events. By contrast, the Suisman scheme relies on smaller clusters of people in a setting furnished by intimately scaled components. The experience of the street unfolds incrementally, from the point of view of the strolling pedestrian. Exactly How Many Amphitheaters can Bunker Hill Take, Anyway? In the end, amphitheaters and cafes are architectural shorthand, symbols for the gathering of people. Cal Plaza has several such amphitheaters and many cafes, so will Disney Hall. They are emblematic of a surrogate public life in a city that rejoices in the private. You find similar, artfully combined elements at City Walk in Universal City. In each case, they serve captive audiences. In essence, they have become an adornment of commerce. Does Bunker Hill need more such elements? Are these the kind of places where people want to gather? Or are there other paradigms that create authentic places for public life to take place in a city like LA? Oddly enough, neither Fifth Avenue in Midtown nor Michigan Avenue’s Magnificent Mile boast a lot of cafes or amphitheaters. Rather, they rely on the spectacle of opulent storefronts. It is the flagship emporia of the mightiest retailers that provide the backdrop for urban life in the rival metropolises of New York and Chicago. Explicitly, Doug Suisman refers to the Ramblas in Barcelona as a precedent for his Esplanade, almost inevitably forcing us to make comparisons. If the Ramblas or other such places are cited as precedents, can they be effective catalysts for generating authentic focal points for public life in LA? In Barcelona, the boulevard is a mixture of stalls for flowers and pets, and cafÈs served by restaurants in the adjacent buildings. The waiters have to negotiate several lanes of traffic to serve their customers in the center of the street. The ritualistic drama of the dodging waiters is as essential to the vitality of the street as the mix of activity along it. The pattern of activity has evolved over time. The street follows an old riverbed at the edge of the Gothic City, which was later filled in for a market outside the walls of the city. It is at the dividing line between two city grids, two sections of town from different eras. The instantaneous creation of an urban park and restaurant row in the middle of an American Boulevard is, in the end, an invention of a different order. Its success almost requires the suspension of disbelief. However, as a thoughtful, virtuoso intervention, its singularity might draw enough attention to make it a popular attraction. It might even become the centerpiece for a new cruising strip. The power of the Gehry scheme, in contrast to Suisman’s, relies more on an abstract surrealism than to familiar icons of urban space. The preoccupation with conquering elevation changes and reuniting the fragmented ground plane results in a fertile terrain in which to experience the city. Rome’s Spanish Steps or the Campidoglio come to mind as urban places orchestrated around changes in elevation but neither possess the axial formality or the shear magnitude of the setting depicted here. Such spaces rely on the contrast between compression and expansiveness. They are both grand gestures squeezed into tight, dense urban neighborhoods and they are filled with life by virtue of the surrounding pressures of human occupation. The reconfigured plaza and mall of the Gehry team is emphatically expansive, as much the setting for the speeding car as it is for the strolling pedestrian. It reflects a context that is spacious and uncrowded. The creation of successful public spaces in the heart of the city is to some extent a question of critical mass. The ebb and flow of different user groups and the changing rhythm of occupation at different hours of the day and night are the true tests of viability and authenticity. Hence, Michigan Avenue’s Magnificent Mile and Fifth Avenue in Midtown thrive from the shifting presence and volume of people working, shopping, and living near-by, twenty-four hours a day. If the spaces envisioned by Gehry and Suisman cannot rely on a huge, ever present downtown population, are they viable concepts? The question is whether or not these spaces can be reinterpreted and appropriated in different ways. Is Gehry’s amphitheater as effective as an empty space as it is with the LA Philharmonic performing on the edge of Grand Avenue? Would Suisman’s Esplanade be a comfortable place to sit with lots of automobile traffic swishing by on either side but no cafÈ diners? Given the Gehry team’s proposal for the Music Center, people might very well be inclined to stay at the upper plaza, where the maze of theater entrances, presumably the presence of food, and the views to the avenue and mall below might create attractive corners in which to cluster. You would need the overlay of Suisman’s cresent of restaurants to allow the avenue itself to be occupied. A periodic street closing might be required to get people in the habit of occupying Suisman’s elegant Esplanade at MOCA and Cal Plaza. For either of these scenarios to be viable, LA’s central city must be seen as more than the sum of distinct cultural, commercial, and residential enclaves. The intensification of urban space on Bunker Hill requires a more radical attitude about the way land is zoned, developed and occupied. Good streets have lots of front doors and a multitude of uses and users. The degree of success achievable by either the Team Gehry or Suisman schemes depends on the degree to which the edges of existing buildings and plazas can be redefined. In its relatively short history, Bunker Hill has undergone remarkable transformations but remains an unsolved puzzle. In the last two decades, many schemes have been brought forward and then laid to rest, before action could be taken. Suisman’s design for the CRA was put on hold as the Performing Arts Center initiated its own series of Gehry inspired workshops under the direction of Altoon + Porter. Now, urban design consultant Martha Welborne is overseeing a new team on behalf of the City, County and Music Center, this time with A.C. Martin and Partners as the design lead. The results of the workshops are now being tested in terms of feasibility and financial viability. There is a new sense of purpose in the air. We can only wait and see which ideas of so many talented designers survive, and what new ones emerge to make their mark on Bunker Hill.